Now that I’m working in my new space, one of the first embroidery projects I’m setting up is the salvage work on a piece of figure embroidery that I wrote about several months ago. You can read the backstory on this figure embroidery here, where I’ve arranged all the articles about it so far in chronological order. Having more space to work is so wonderful! Now I can keep this project set up so that I can work on it more efficiently as time allows. As you can imagine, taking out and setting up something like this can be prohibitive to making much progress, since the set up and the take down for short work sessions eat up a good bit of time. The salvaging of this piece is going to happen in two parts. I’ll explain my planned process below. There are still a few kinks I need to work out and a few ideas I want to explore before making Absolute Decisions on the process, but I’ll share those with you as I go along! This is the figure that I’m relocating to a new piece of ground fabric and adding a new frame around. The white circle represents the new frame. The original piece that I took the figure from is pictured above. The figure had a marquise-shaped frame around it, with embroidered foliage creeping over the original frame and intruding on the embroidered figure right around the base of it. 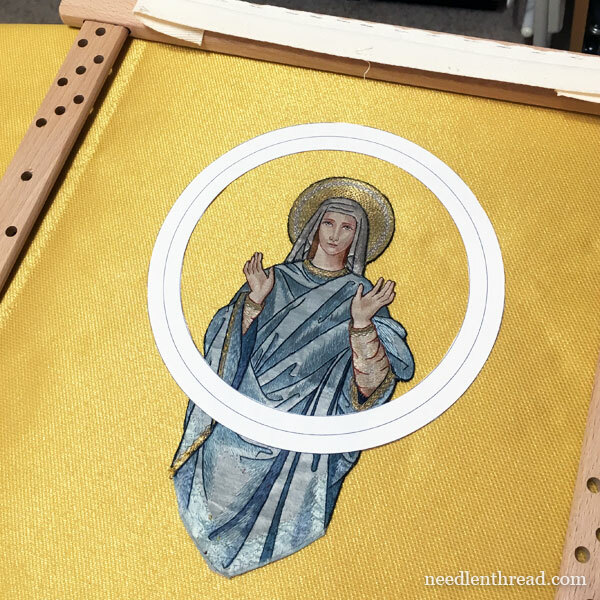 To salvage the figure, I’m going to stitch a smaller circular goldwork frame that cuts across the base of the figure, covering up the areas where the previous frame was worked over the embroidery. I can’t think of any other way to cover up the holes and other damage from the original outline and intruding foliage. And when it boils down to it, I prefer a round frame, anyway! It’s a nice fabric! You can find it through Watts & Co out of London. One thing that often troubles me when salvaging old pieces of embroidery like this is the noticeable difference between old and new. When placed on new fabric, old embroidery like this tends to look a little dingy. And while I could scour the earth for old fabric that would provide a more coherent aged look for the whole piece, in most cases, once finished, the new and the old will somehow meld together and look fine. Especially when you consider that a piece like this will be mounted on a larger vestment made from new fabric with new trim, it doesn’t really make sense to use antique fabrics and already-oxidized gold in order to recreate a totally vintage look. Then the whole piece would look noticeably dingy on the brand new vestment. That’s one of the funny things about creating new pieces of ecclesiastical embroidery. I often find that folks who are looking for hand embroidered ecclesiastical needlework tend to compare new pieces with old embroidery. They think the new looks garish, compared to the old. But if you consider that the old is just that – old! – and you realize what it would have looked like, created new, then you can imagine that these old pieces were actually quite lively with color and sparkly with gold. They weren’t the muted antiques we see today! It’s sometimes hard to explain that to people. I’ll be working this salvage job on two slate frames. If you’re not familiar with what a slate frame is, I’ve written about them here, with a an article here on setting up, or dressing, a slate frame. On the first slate frame, I’ll work the circular frame for the piece. I’ll be stitching goldwork threads over wool felt tacked on a linen ground fabric. When the circular frame is finished, I’ll cut it out and move the work to the other slate frame. On the other slate frame, where the whole piece will come together, I’ll start with a linen base, onto which I will tack the new cloth of gold. 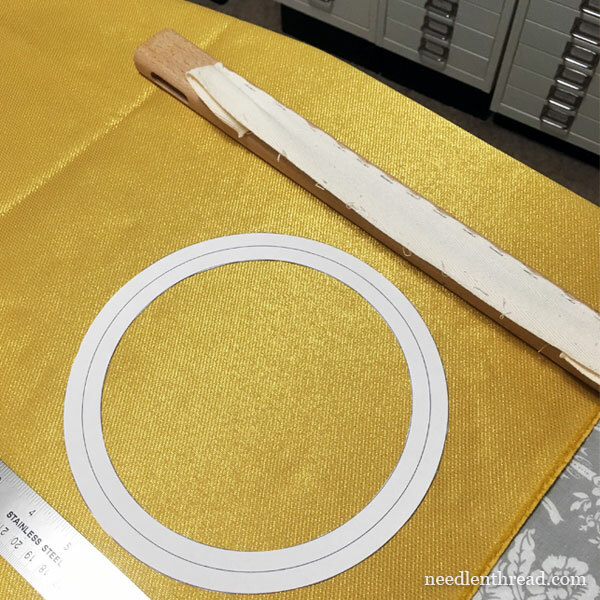 Then, the figure will be tacked in place, I’ll couch an outline of silk around the figure, and then I’ll apply the new circular goldwork frame around the figure. Then, the whole piece will be cut from the second slate frame and treated as an appliqué, to be applied to a new vestment. It’s not a small job and it will take some time. But once I get it completely set up, it’s just a matter of working carefully through the steps. I foresee a few areas where extra care needs to be taken. And I’m still troubleshooting ideas for how to manage cutting off the excess on the figure embroidery. Either wheat paste or rice glue will most likely come into the picture. I’m also a little troubled by the creases that just won’t release from the original figure, which come, most likely, from bad storage solutions. I’m going to experiment a bit on how to resolve that issue (if it can be resolved without damaging the figure). So, a fun adventure! I’ll share it with you in little bits as I go. I won’t be working on the piece full time, though. Too many other things to tackle, now that I have plenty of room and no interruptions! What’s in my hoop at the moment? I’m working on the embroidered samples for the upcoming youth classes I’ll be teaching in July. I’ll share those with you soon! And I’m re-working this tree, with a few alterations. I’m also figuring out the logistics of my new camera set-up, and practicing some video. You’ll see the fruits of all of that labor here soon! What’s in your hoop at the moment? Whatever it is, I hope it’s providing you with abundant stitching joy! Mary, I have been following your new adventure and am thrilled for you. I am an intermediate embroiderer and crazy quilter (you featured one of my pieces on your blog). I have been thinking myself about offering a youth embroidery class in my town. I would also like to see the tradition passed on. While I can’t do it right now, I think it may be possible in a year or so. This brings me to a suggestion for you (not that you need more work), but you might consider creating a syllabus for your youth class that would be available for purchase. It would provide a way for us pay forward a hobby that has brought us joy. I myself learned to embroider from a class I took as a child. It’s food for thought . Good luck with the new digs. I’m thrilled for you. What a fascinating project! 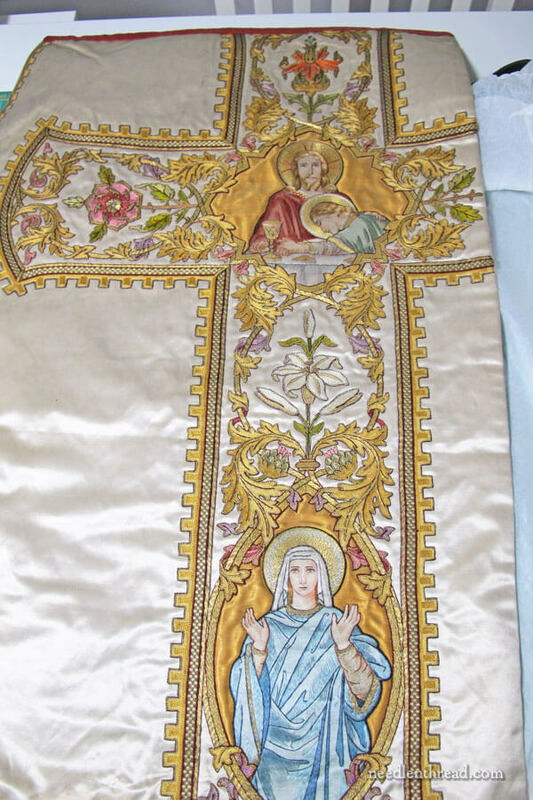 I’ve done a bit of work over the years on altar linens, and made new, modern vestments as gifts, but I’ve never tackled any vintage or antique vestments. 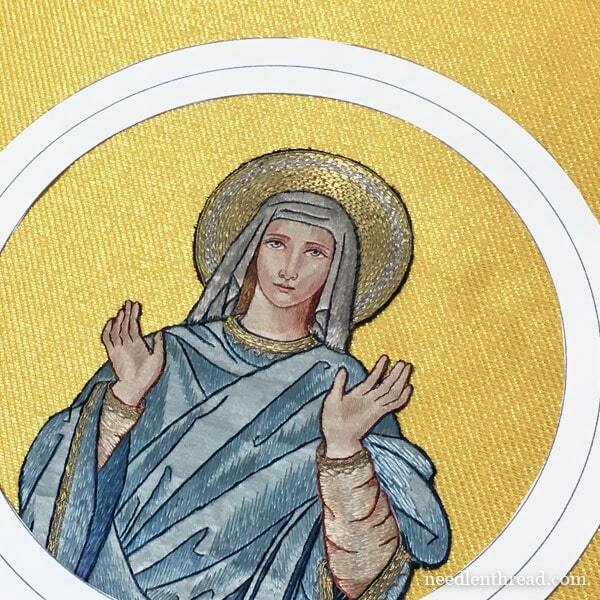 So I’m following this (and want to order the Marian Medallion book soon). Good luck with the project it looks very complicated and I can’t wait to see the progress on the piece and I know I will learn a lot from it, I really like the gold fabric you have chosen which will look great against the figure. Good luck with setting up for the youth classes that sounds fun. Thanks for sharing with us the process of salvaging figure embroidery and for the photos look forward to the progress on this piece. Good Day Mary, what a great project to “break in” the new space. Quite inspiring! Right now in my hoop, my evertite frame I should say is the Jade dragon from Colleen Goy’s kit on silk background. Another big bite to chew for me as I am not very experienced in the art of Embroidery but determined. I have read again the kit review you had a while ago and you are absolutely right to say that the instructions are hard to understand for a beginner level. However I took the time to study each component and I think I am ready to give it a go. Wish me luck…….I will need some. Enjoy your new work space! Hi Mary, recently I’ve been following your Marian Medallion Adventure from 2012. I’m excited that you’re about to start a similar Adventure in ecclesiastical embroidery right now. I’m looking forward to learn a lot from you, I’m sure it will be highly interesting and instructional. You gave me incentive. Although I didn’t move, I did clean and vacuum my sewing space and now have a new quilt on the frame. I’m currently salvaging old T-shirts turning them into memory quilts for a couple of people. Not quite as exciting as antique embroidery, but it is always fun to make the old into something new. It is amazing how old used embroideries or even T-Shirts can find new life with new threads and fabrics sitting beside them. Happy sititching, I can’t wait to see the progression of your emmbroidery. It seems recycling always has a few surprises along the way. I so enjoyed reading this !